I really enjoy trying new recipes, especially if I am expecting a large family gathering. Feedback from multiple samplers helps me decide on winning recipes. This Christmas Bark recipe, really sparked my interest, because it is very easy to make, and turns a simple saltine cracker into a scrumptious delicacy. I am sure your family and friends will love it as well. This recipe yields about 40 pieces. Line bottom and sides of baking sheet with parchment paper (not waxed paper). Arrange one layer of saltines to cover the whole bottom of pan. Melt butter and brown sugar in medium saucepan. Cook for 3 min. stirring continuously. Pour butter-sugar mixture (caramel) over the crackers. Spread evenly. Remove from oven and sprinkle with chocolate morsels. When they start to melt, spread evenly over the entire layer of crackers. 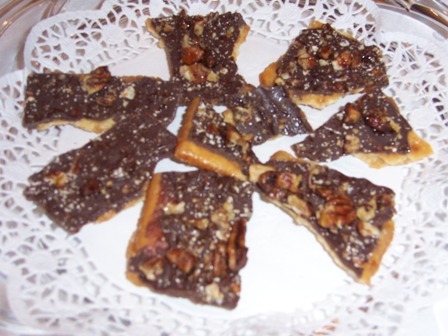 Remove from refrigerator, peel off the parchment paper, and crack the bark into serving pieces. When I tried this recipe for the first time, I ran out of parchment paper, and decided to use waxed paper instead……BIG mistake……..since the butter-sugar mixture caramelizes during baking time, then STICKS to the waxed paper as it cools and hardens, making it VERY difficult to peel off. I hope you read this comment, to spare yourself of the mess I got myself into. I made this bark for a neighborhood BBQ and the platter was empty in less than 20 minutes! People kept asking me if I brought another tray! It is DELICIOUS!! Thanks for the “warning”. You might have just saved someone from being put on the spot. I totally agree, since I ran into a similar situation, but since the party was at my home, I was able to quickly replenish it.